A detailed examination of the relationship between the discourses and practices of authority and diplomacy in the late medieval and early modern periods, Authority and Diplomacy from Dante to Shakespeare interrogates the persistent duality of the roles of author and ambassador. 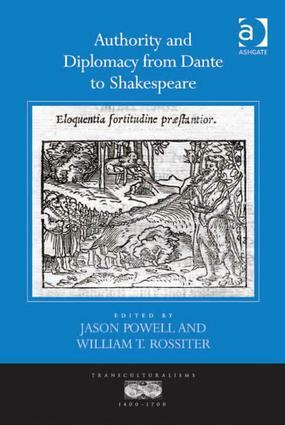 The volume approaches its subject from a literary-historical perspective, drawing upon late medieval and early modern ideas and discourses of diplomacy and authority, and examining how they are manifested within different forms of writing: drama, poetry, diplomatic correspondence, peace treaties, and household accounts. Contributors focus on major literary figures from different cultures, including Dante, Petrarch, and Tasso from Italy; and from England, Chaucer, Wyatt, Sidney, Spenser, and Shakespeare. In addition, the book moves between and across literary-historical periods, tracing the development of concepts and discourses of authority and diplomacy from the late medieval to the early modern period. Taken together, these essays forge a broader argument for the centrality of diplomacy and diplomatic concepts in the literature and culture of late medieval and early modern England, and for the importance of diplomacy in current studies of English literature before 1603. Contents: Introduction, Jason Powell and William T. Rossiter; The art of saying exile, Elisa Brilli; Petrarch and the Venetian-Genoese war of 1350-1355, Alexander Lee; William de la Pole’s poetic ’parlement’: the political lyrics of Bodleian MS Fairfax 16, Mariana Neilly; ’I beseik thy Maiestie serene’: difficulties of diplomacy in Sir David Lyndsay’s Dreme, Kate Ash; ’Not cardinal but king’: Thomas Wolsey and the Henrician diplomatic imagination, Bradley J. Irish; In Spayne: Sir Thomas Wyatt and the poetics of embassy, William T. Rossiter; License and Lutheranism: diplomatic gossip, religious identity, and the Earl of Surrey, Mike Rodman Jones; Tasso at the French embassy: epic, diplomacy and the law of nations, Diego Pirillo; The 1559 Peace of Cateau-Cambrésis: print, marriages of state, and the expansion of diplomatic literacy, John Watkins; Astrophil the orator: diplomacy and diplomats in Sidney’s Astrophil and Stella, Jason Powell; Public diplomacy and the comedy of state: Chapman’s Monsieur D’Olive, Mark Netzloff; Shakespeare’s kingmaking ambassadors, Joanna Craigwood; Bibliography; Index. Jason Powell is Assistant Professor at Saint Joseph's University, USA. William T. Rossiter is Senior Lecturer at the University East Anglia, UK.